"That was not the easiest entrance I've ever made," Donald Trump said. Most people, especially distinguished guests, typically pull up into a parking lot, tip the valet and enter calmly through a front door. Presidential candidate Donald Trump -- someone who has professed to love walls -- was forced to jump over a U.S. Highway 101 median, or at least skirt one and hop down onto a bank of grass, in order to enter the Hyatt Regency Hotel in Burlingame, California. 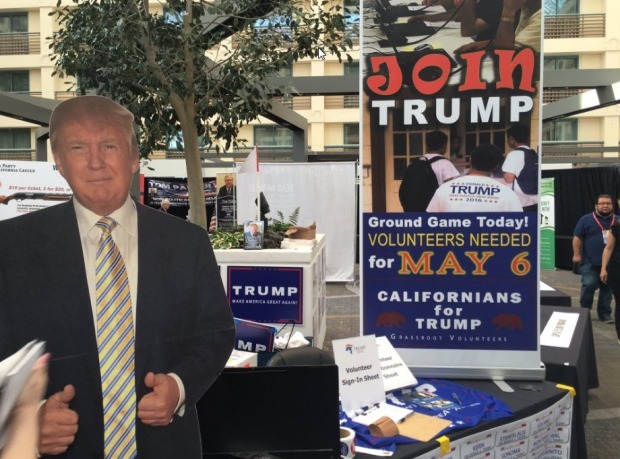 That's where he was the keynote speaker at the California Republican Convention on Friday. Never one to miss a dramatic moment, Trump said to an adoring crowd: "That was not the easiest entrance I've ever made." Pausing for a moment, the charismatic business mogul who has said that Mexican are rapists and Muslims shouldn't be allowed into the country, then quipped: "I felt like I was crossing the border." He and his entourage couldn’t get in the normal way because anti-Trump protesters had blocked off Old Bayshore Road. People jumped to Twitter to have some fun. Those on the left, like Ethan Kassel tweeted: "That's delightfully ironic." Those on the right, like Spencer Stiles, tweeted: "Liberals = Professional victims." Jeff Manghera noted, "Should have built a bigger wall." When Trump finished his speech, he left the same way he came: Over the wall.